If you are an investor who owns stocks in your portfolio, your company board of directors may be doing you a disservice by paying the CEO too much. According to this article in the American Association of Individual Investors website, the company returns for CEOs that get paid in the upper tiers are much less than in companies where the CEO is paid in the lower tiers. See the graph to see what Ric Marshall and Linda-Eling Lee of MSCI’s ESG (environmental, social and governance) research team found. Have you seen how much CEOs get paid these days? Usually upward of several million in compensation each year and at the top tiers, in the tens to hundreds of millions each year. Think about that. Even with a million shares of stock outstanding, a $10 million payout to the CEO is taking $10/share out of your pocket and giving it to the CEO. 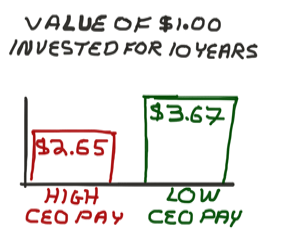 I have a theory on this, but it is only a theory: those CEOs who get paid top dollar probably believe they deserve it. And the lower tier CEOs are probably more humble and would rather do things for the betterment of the whole company (and its investors) than take such a large expense for himself. Who would you rather have in charge of your company? A humble person or one who thinks he knows it all?